I try to wear color. I swear I do. But, as it turns out, I just can't get away from my two favorite tones: black and white. So I've thrown in the towel on even trying, and now I just let color come through in my accessories... or in my makeup... or in my atmosphere. When all else fails, I let my personality be colorful enough to make up for the complete and utter lacking of a colorful ensemble in my wardrobe. What can I say, I just like black and white. 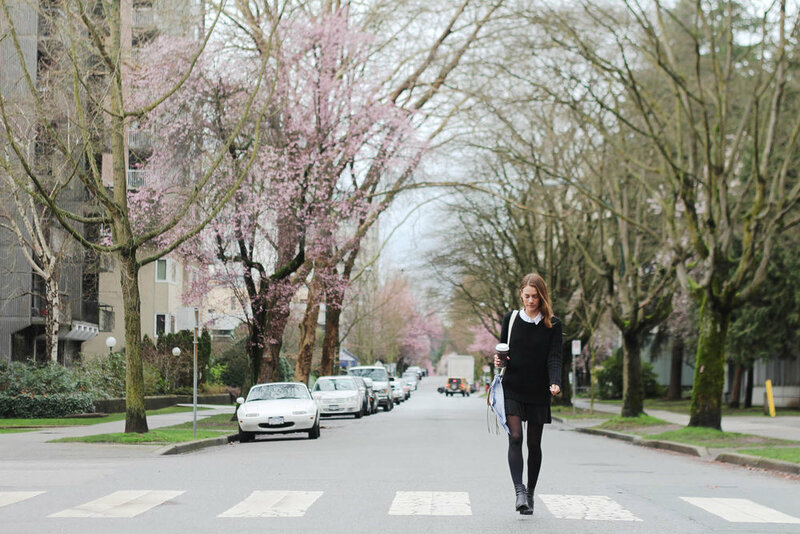 With spring blossoming in Vancouver (even though it still feels really cold to be spring), it was pretty easy to get away with wearing sans color – the beautiful pink cherry blossoms scattered around the West End did the trick. For good measure, I tied a blue scarf around my bag and called it a day. Or at least an outfit. Happy Sunday – oh, and happy Macaron day!